Welcome back to FanDuel Picks Week 14, your one-stop shop for the best daily fantasy football advice. While there were some bright spots Week 13, we put up our first dud this year, aided by bust wide receivers Stefon Diggs and Kenny Golladay, as well as a disappearance act put on by Jared Goff (9.08) just one week after his opponent (the Detroit Lions) was shredded by Chase Daniels. Sure, Jarvis Landry, proved to be a good find at his low price, and the New York Giants DST delivered as the defensive pick of the day. But no real standouts given the prices and associated values. But I am back at school and hitting the books hard with just a few FanuDuel weeks left. As a note, these picks are based on Sunday only leagues, so players on Thursday, Sunday night, and Monday night will be ignored. Andrew Luck, QB, Indianapolis Colts ($7,900) – After ruining daily fantasy players days Sunday, Andrew Luck comes into Week 14 having his streak of 8 consecutive games with 3+ touchdowns passes being broken. And while most daily fantasy players will likely fade Luck due to the regression and poor showing Week 13, that is exactly when I see the most value. Houston, winners of 9 straight, boast one of the better pass defenses in the NFL, and allow the ninth least fantasy points to opposing quarterbacks. However, stud defensive back Jonathan Joseph left Week 13 with a neck injury and looks unlike to play Week 14. Also, only one quarterback this year put up over 23 FanDuel points against the Texans voracious defense. Any guess? That’s right, Andrew Luck did Week 4, putting up a whopping 464 passing yards and 4 touchdowns for 35.66 FanDuel points. Jameis Winston, QB, Tampa Bay Buccaneers ($7,700) – In a game with the highest projected game total Sunday (55.5), Jameis Winston and the Tampa Bay Buccaneers should be chucking it all over the field as 8 point home underdogs against the Saints porous secondary. The Saints have allowed the third most fantasy points and third most passing yards per game to opposing quarterbacks, and in Week 1 allowed these same Bucs (manned by Ryan FitzMagic) to score 48 points, allowing 400+ passing yards and 4 passing touchdowns. 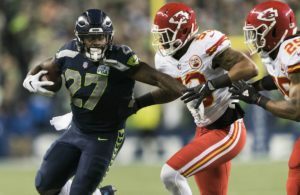 Winston comes into this contest red hot, having thrown for multiple touchdown passes in each of his last three games, and eclipsing 22.5 FanDuel points in the past two. Christian McCaffrey, RB, Carolina Panthers ($9,100) -The human fantasy cheat code cannot be stopped. Even as the Carolina Panthers free fall out of the NFC playoffs, Christian McCaffrey continues putting up absurd numbers. McCaffrey totaled 161 yards and a touchdown last week in Tampa, and this week faces a Cleveland team allowing the third most touchdowns and fifth most rushing yards to opposing running backs. With Greg Olsen out, McCaffrey’s volume could increase to absurd levels the remainder of the year. Ezekiel Elliott, RB, Dallas Cowboys ($8,800) – This game has playoff atmosphere written all over it. In a game that will likely determine the winner of the NFC East, the 6-6 Philadelphia Eagles travel to the Lone Star State to take on the 7-5 Dallas Cowboys. Dallas already won in Philadelphia earlier this year, so the defending Super Bowl champs are looking for revenge and to take back control of the division. However, Ezekiel Elliott may have a thing or two to say about that. Elliott has been an absolute monster during Dallas’ 4 game win streak, totaling 667 yards (167 yards per game) and scoring 5 touchdowns. In their Week 10 matchup Elliott enjoyed his best game of the year, totaling 187 yards and 2 scores. In a game Dallas needs, look for the Boys to rely on their bellcow running back. Jaylen Samuels, RB, Pittsburgh Steelers ($4,600) – These next two are two of RSJ’s top waiver wire adds Week 14, and look primed for big fantasy days for their respective teams. Let’s start with Jaylen Samuels. Pittsburgh ruled James Conner (ankle) out for Sunday’s contest in Oakland, and while Mike Tomlin suggests a committee approach, Samuels should shoulder the majority of carries. People will likely point to his 12 carries on the year and suggest he cannot and will not command a high volume out of the Steelers backfield. But Stevan Ridley has the second most running back carries this year with just 18. 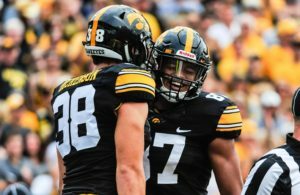 Samuels scored a touchdown last week and has been mixed into the offense throughout the year, so I except Pittsburgh to see what they have in their versatile rookie. Justin Jackson, RB, Los Angeles Chargers ($4,500) – On the other hand, there’s Justin Jackson. Playing behind Austin Ekeler, Jackson dazzled on his 9 touches (all in the second half), producing 82 yards and a touchdown. With Mlevin Gordon likely sitting this one out, look for the Chargers to explore what they have in their rookie seventh rounder in a game with a positive running game script (LA projects as a 14 point home favorite). Deandre Hopkins, WR, Houston Texans ($8,600) – Although boasting one of the better passing defenses this year, the Indianapolis Colts struggled to contain arguably the game’s best receiver Week 4 as Deandre Hopkins caught 10 balls for 169 yards and a touchdown. This game has sneaky shootout potential, seeing as the last game saw 71 total points between the two teams. With Houston looking to lock up the AFC South, look for Hopkins to lead the Texans to glory. Michael Thomas WR, New Orleans Saints ($8,300) – It’s gonna be a high scoring affair, and the Saints will most certainly get theirs in the passing game against a Tampa Bay defense allowing the second most fantasy points to opposing wide receivers. The Saints will look to avenge their Week 1 loss to Tampa, and Michael Thomas might have some extra motivation. However, if he just provides the same stat line from Week 1 and nothing extra (16 catches on 17 targets for 180 yards and 1 TD), we will all be happy. Courtland Sutton, WR, Denver Broncos ($5,600) – The Broncos FINALLY fed their rookie superstar wideout, and Courtland Sutton delivered career high’s in targets, receptions, and receiving yardage. On Sunday, Sutton matches up against a 49er squad that just allowed 4 TD passes to opposing wide receivers, none of which have Sutton’s talent, speed or skill set. With Denver placing Emmanuel Sanders (achilles) on IR, Sutton will be a target hog from here on out. Chris Godwin, WR, Tampa Bay Buccaneers ($5,600) – I want as much exposure to the Saints / Bucs game as I can get. And while there are a lot of high-priced heavy hitters, I like bargain basement shopping for those hidden gems. Chris Godwin finally got back on the touchdown track last week, catching 5 balls for 101 yards and a touchdown. On Sunday, Godwin gets a Saints defense that he scored against already in Week 1. His upside is limitless playing across Mike Evans, and he could be a true #2 if DeSean Jackson misses Sunday’s game. 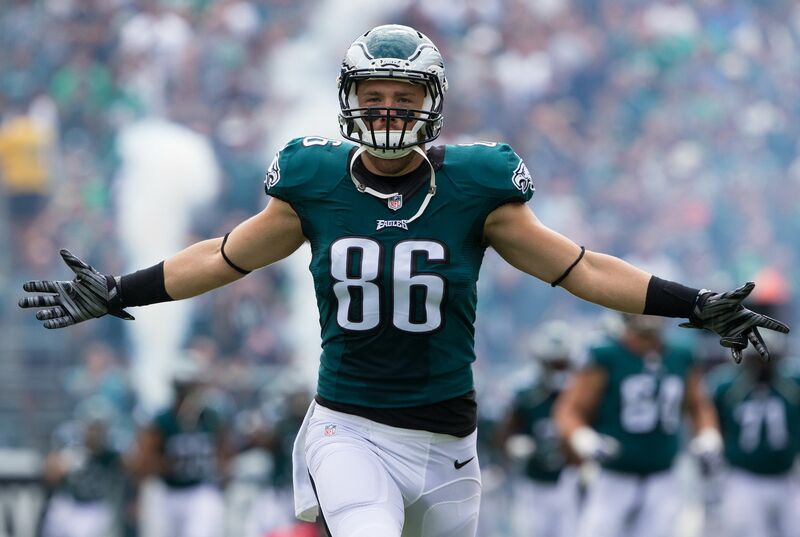 Zach Ertz, TE, Philadelphia Eagles ($7,400) – He has been so good this year, it Ertz! Enough of the funnies. Zach Ertz has been a man amongst boys on the football field this year, catching 93 balls for 978 yards and 6 touchdowns. Last time these two teams faced off, Ertz ripped Dallas for 14 catches for 145 yards and 2 scores. With Philly’s season on the line, look for Carson Wentz to target his sure-handed, big play playmaker early and often. David Njoku, TE, Cleveland Browns ($5,300) – Baker Mayfield looks better and better each and every week, and that only means good things for his skill position players. And while he and David Njoku failed to connect last week, Njoku should find much more space to operate Week 14 against a Panthers defense allowing the third most fantasy points to opposing tight ends. New England Patriots DST ($4,200) – The New England Patriots as a team put together arguably their best performance in Week 13’s home win over the Vikings. However, it was not the offense, but rather the New England Patriots DST that put forth the more impressive performance between the two units, holding the talented Minnesota offense to just 10 points. On Sunday, the Patriots travel to Miami to face a sputtering Dolphins team that has lost 4 of its last 6 games. New York Giants DST ($3,500) – Alex Smith, broken leg. Colt McCoy, broken fibula. Mark Sanchez, perfectly healthy! 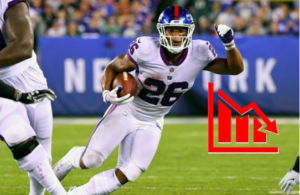 The Handsome One is set to take over quarterback duties against the New York Giants, marking the second straight week the New York Giants DST will square off against a backup. Last week, the Giants produced 17 fantasy points, including 5 sacks, 3 turnovers and 1 defensive touchdown, so I expect a repeat performance against The Sanchize. And that’s a wrap for Fanduel Week 14 analysis. Remember to always look at the matchups and Vegas totals, which are always telling, and do not be afraid to admit they know more than you, because they usually do. Until next time, good luck and don’t forget to tip me 10% of your earnings. Thanks in advance.